Employees with Mercy Regional Medical Center delivered several truckloads of food donations to Silverton during the past week, said Janice Sanders, owner of the Old Arcade Trading Co. in Silverton. In addition, donations have come from the Durango Food Bank and from a food drive organized by The Wells Group in Durango. The Silverton School gymnasium is nearly full with food donations that have been delivered during the past week. “We’re really grateful for the camaraderie and generosity of our neighboring communities,” said Janice Sanders, owner of Old Arcade Trading Co. in Silverton. Morgen Dorsey with the Wells Group said Team North Star, a division of the agency, was trying to figure out how to help people in Silverton struggling with the precipitous drop in tourism since the start of the 416 Fire on June 1. The Durango & Silverton Narrow Gauge Railroad, the town’s summertime economic engine, has suspended service as a result of the fire, and for more than two weeks, U.S. Highway 550 was closed intermittently, further limiting access to the mountain town. The highway fully reopened Sunday. “We wanted to do some sort of donation, and we just organized it into an old-school food drive,” Dorsey said. Once the Wells Group announced its plans online, the post was shared more than 500 times, she said. That led to others assisting with donations, including Mercy Regional Medical Center, Walmart’s store in Durango and Backcountry Experience. Dorsey said the first shipment of food went to Silverton midweek, then another shipment went Saturday. So much food was collected by Mercy, she said, hospital employees made their own deliveries. 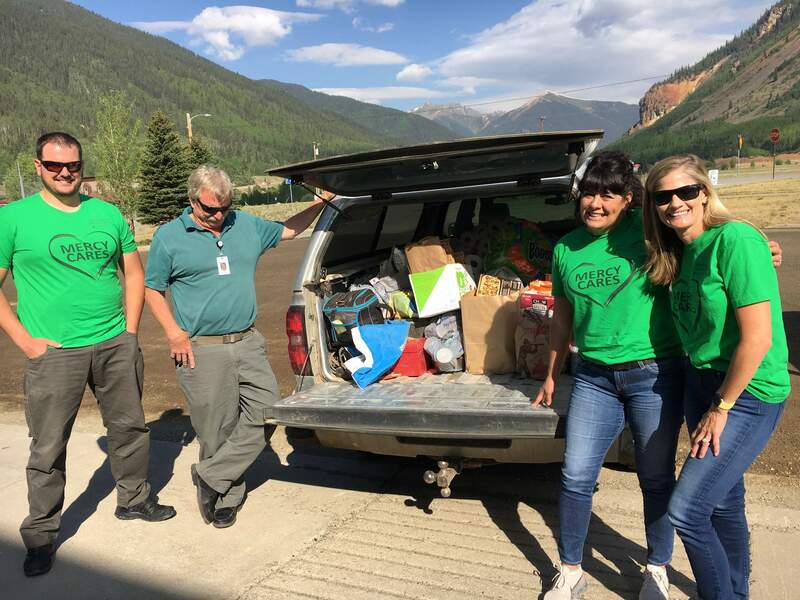 The Durango Food Bank also delivered almost 2,000 pounds of food, household supplies and personal hygiene items to San Juan Social Services in Silverton on Friday. Emergency food relief boxes will be distributed to residents of Silverton who have been impacted by the 416 Fire. She said the Durango Food Bank will make trips to Silverton to restock as needed while the mountain town continues to struggle with the adverse economic impacts of the fire. Sanders reported a virtually full gymnasium as of Sunday. She added that several real estate agents came up from Farmington with food donations. Shops in Silverton, by and large, have remained open despite the small number of visitors coming to town. Staying open has been difficult, Sanders said. Sales at her Old Arcade Trading Co. are down 95 percent for June, she said. “We just want everyone to know we’re still here and open every day,” she said.